It's a great time to be reviewing addition facts in your early elementary classroom, right? 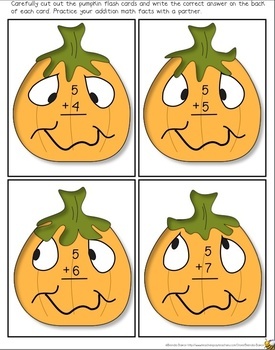 These silly little pumpkins are determined to help! Print the cards out onto cardstock for durability; you could even hand out a full packet to each student, tied with orange and black ribbon, as a Halloween treat - way more useful than candy! Addition facts cover 0 to 10.